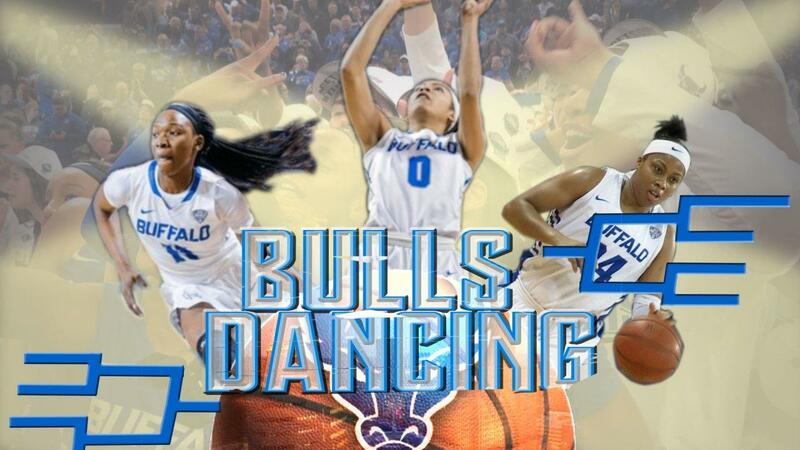 The University at Buffalo women’s basketball team defeated Rutgers 82-71 in the first round of the NCAA Tournament at Gampel Pavilion on Friday. With the win, the Bulls improve to 24-9 on the year and become the first MAC team to win an NCAA Tournament game in back-to-back years since MAC women’s basketball began in 1982. Junior Summer Hemphill led the way for Buffalo with a game-high 23 points, while adding seven rebounds, two assists, two blocks and a steal. Cierra Dillard also cracked the 20-point plateau, pouring in 20 points while adding six assists, four rebounds and four steals. Also in double-figures were Hanna Hall and Autumn Jones with 12 points each. It marked the fourth straight game Buffalo had four players in double figures. It was a battle to start with the two teams trading baskets early on, but a Dillard step back triple put UB up 13-12 at the first media timeout. After Rutgers tied the game 15-15 the Bulls opened up a 5-0 run, capped by a Dillard three, to take a 20-15 lead at the 2:25 mark. Rutgers answered with a 4-0 run but Hemphill countered with an and-one to take a 23-19 lead and Jones would end the quarter in dramatic fashion, banking home a triple at the buzzer to give UB a 27-21 lead after one. The Bulls shot 8-for-16 from the field, including 5-of-8 from beyond the arc, in the opening quarter. Rutgers’ Charise Wilson cut the UB lead to three early in the second quarter but the Bulls answered with a 5-0 run on a Hemphill bucket and Dillard three to extend the lead back to eight. The Scarlet Knights battled back, rattling off a 6-0 run to cut it to 34-32 but Jones scored on the other end to stop the bleeding as the Bulls maintained a 36-32 lead at the media timeout. Rutgers would stay hot out of the media, extending their run to 14-2 to take a 40-36 lead with 1:52 remaining in the half. The Bulls were held without a field goal for over five minutes but broke through in a big way courtesy of a Hall triple at the buzzer to cut the deficit to 43-41 at the break. Rutgers opened the third quarter on an 8-2 run to take a 52-43 lead at the 8:14 mark. Buffalo clawed back, answering with a 10-0 run to retake the lead 53-52 at the 4:35 mark but Rutgers stopped the run with a three to take a 57-56 at the media timeout and then used a mini 4-0 run to take a 61-56 lead but Jones came up big again, draining her second triple of the game to cut the Scarlet Knights lead to 61-59 after three quarters of play. The Bulls stayed tough, opening the fourth quarter on a 5-2 run to retake the lead 64-63 at the 8:08 mark and a Hemphill triple, just the fourth of her career, on the other side of a timeout put UB up 67-63 at the 7:12 mark. Rutgers would tie the game 69-69 but Hemphill had an immediate answer on the other end, powering up for the and-one to put UB up 71-69 at the final media timeout and then the Bulls put together a 5-2 run to go up 76-71 with 2:22 remaining and they would secure the victory from the charity stripe from there. Buffalo shot 27-of-54 (50.0%) from the floor, 12-of-23 from beyond the arc, and converted 16-of-19 attempts from the free throw line, while holding Rutgers to just 4-of-21 from deep. The Bulls also won the rebounding battle 39-33. Buffalo will face the winner of No. 2 Connecticut and No. 15 Towson in the round of 32 on Sunday. Time to be determined.